The Adventures of an Intrepid Reader: More Susan Boyle! Susan Boyle seems to have taken the whole world by storm! Here's a link to a recording of Cry Me a River that she did 10 years ago for a charity recording! Absolutely beautiful to listen to. She is amazing!! What I want to know is where has she been and why haven't we heard of her before this with a voice like that? What gorgeous voice. I hope she gets her big break now--I think she is the same age as me. 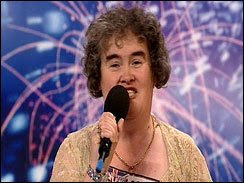 I say, you go girl, Susan Boyle! Amazing voice - that woman is definitely going places - go Susan!!! Wow, that is even more wonderful than the song she sung for the show! She's gonna win, the others might as well go home now. The whole world is behind her now. Absolutely everybody knows who she is! Good for her, amazing!